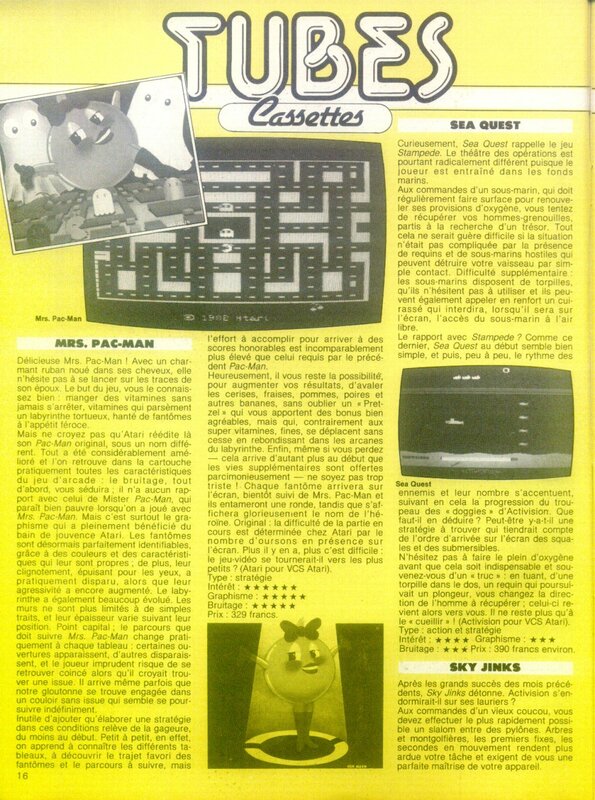 If you’re planning on developing a well-rounded 2600 collection, Ms. Pac-Man is a must-have. If you just want to play Ms. Pac-Man, there are other readily-available options that are closer to the arcade version (the NES alone has two separate Ms. Pac-Man titles). Ms. Pac-Man is everything Pac-Man should have been. It's a good-looking game as well as a good-playing game. The only question is: Why couldn't Atari have done this the first time? Kritisch muß man fragen, ob nicht die Inhalte beider SpielCassetten auf eine gepaßt hätten, aber das Geschäft muß wohl blühen. Mais ne croyez pas qu'Atari réedite là son Pac-Man original, sous un nom différent. Tout a été considérablement amélioré et l'on retrouve dans la cartouche pratiquement toutes les caractéristiques du jeu d'arcade : le bruitage, tout d'abord, vous séduira ; il n'a aucun rapport avec celui de Mister Pac-Man, qui paraît bien pauvre lorsqu'on a joué avec Mrs Pac-Man. Mais c'est surtout le graphisme qui a pleinement bénéficié du bain de jouvence Atari. Les fantômes sont désormais parfaitement identifiables, grâce à des couleurs et des caractéristiques qui leur sont propres ; de plus, leur clignotement, épuisant pour les yeux, a pratiquement disparu, alors que leur agressivité a encore augmenté. Atari just did a fantastic job with this game. If you're looking for a game from the Pac-Man series, grab this one. It's a common cartridge and can be found easily at whatever source you visit to obtain vintage video games. Wow - this is an outstanding version of the popular arcade game. In fact, this puts the original Atari 2600 Pac-Man to shame. The graphics are surprisingly faithful to the arcade, and the control is dead-on. All of the mazes from the arcade are present, so the only thing missing is the intermissions. My only complaint is that the game is a bit on the easy side. An expert variation with smarter ghosts would have been nice. Those let down by Pac-Man should find relief with this cart, and it does the series proud. Not one to be missed, especially by Pac-Man fans. Ms. Pac-Man herself actually looks circular in nature, each ghost is a different color, and unlike the Atari 2600 Pac-Man, there is fruit instead of a bizarre "vitamin." The maze changes color and layout every few levels, and the introductory music sounds similar to the Arcade version. Along with Jr. Pac-Man, Ms. Pac-Man shows that the Atari 2600, when properly programmed, is capable of some relatively remarkable things. Unlike Pac-man, which has a tendency to get old fast due to its lack of diversity, Ms. Pac-man has enough depth to be worth playing over and over again. I remember that I used to be addicted to this game when I was younger, and even now I still have fond memories of this game. If you have an Atari 2600, you owe it to yourself to add this game to your collection. Ms Pac Man é o herói mais antigo dos jogos de video game. Neste jogo a grande dica é comer as vitaminas grandes, tornando-se assim, invencível.